Our story opens on a terrible day in high school that no doubt many of us have experienced and are loathe to return to. But at the center of the gross “my teacher is from hell and my schoolmates are just as bad” high school mess is a young girl named Priela, who has the uncanny ability to sense things - thoughts, feelings, emotions. She’s not normal and confirms it when something completely otherworldly crashes her reality. There’s a ton of magical realism books out right now, but too few, if any at all, like Priela. That we have a main character who is a math whiz caught up in the magical elements of this world is already a unique journey all together, and therein lies the strength and the key to unlocking her otherworldly destiny. From a story concept and lore perspective, Priela gets 80 billion A+’s from me. I’ll spoil a bit later to explain, but I do want to get a few things out of the way first. The fairest assessment I can give for how the story and concept are executed would be that, just like the main character (trapped between the normal world and her newly discovered other world), to me, the storytelling is caught between middle grade and YA. The themes and character development are very simple, but the situations tend to be very complex. It feels like a middle grade tale wrapped up in YA skin and that presents itself the most when the complex problems resolve quite simplistically albeit with great effort from our main characters (great team Priela! Totally rooting for ya’ll). I get that Jocelyn Karney (who was lovely enough to send me a handwritten letter thanking me for the review) wanted to tell a story that would empower young girls to make good life choices. In fact I laud it. This book quite literally redefines “practical magic”. I just felt like the way everyone’s problems resolved would have been better framed through a full on “middle grade” treatment where there are clear abject life lessons woven into the tales. Right now, it reads almost like if the TV series Charmed were written by the Disney Channel. To me, that’s not a bad thing if you know what you want to get out of the story. And I totally do. And it’s a good story with a great message. And now for the spoiler which, to me, should hook you if you ever want to give practical magical realism a try: Muses. Yep. I won’t spoil beyond that but Jocelyn Karney managed to create a pretty nifty world and then turn it right on its ear by making it practical. I have never been more enamored of the concept of being good at math in my life. I would recommend this for young girls, especially those who may have sadly had their brush with school bullies. 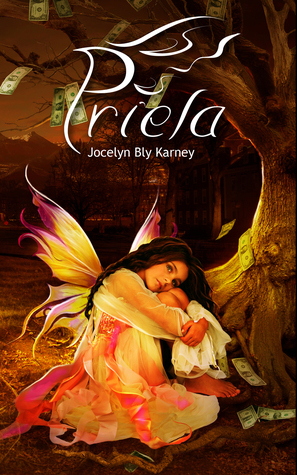 I muse that Priela’s story can most certainly begin to… inspire them that they can be something here in the real world.